I'm a huge fan of this publisher and have generally liked just about every book they release. 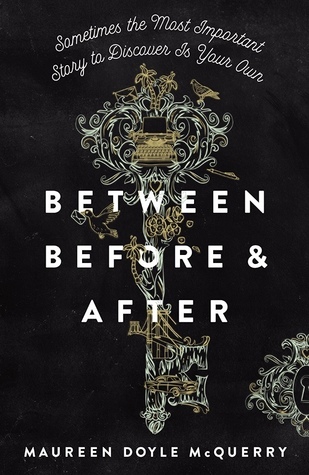 BETWEEN BEFORE AND AFTER is a Time-Slip story set during a difficult time in history where a daughter faces some tough realities of life, and then at another time in history when life is a little simpler but where there are still prejudices and another daughter also faces her own difficulties. It reads more like a Women's Fiction story, and almost like reading a journal account of the prior time as the reader gets flashes and snippets of what happened in the past as the other storyline takes place. Those who love historical novels and memoirs, heavy on the hardships and historical aspects, may enjoy this one. The writing was very well done. I didn't have any issues following along or get confused about which time period I was in. The characters were also quite complex. There were some interesting lessons or questions that the story brought forward and I appreciated that the author didn't really tell the reader what to think, but presented them in a way that it just makes you think. I'll just honestly say that this was one of those stories that jarred me. I was expecting something completely different than what I got and it was hard to reconcile my expectations and the actual story. I also didn't particularly love any of the characters or even relate to them, although I did relate to some of the situations and one of the time periods. It's hard to read something like this that isn't necessarily pleasant to read in the first place, it be something you weren't expecting, and then not really like the characters. I also love Dickens' A Tale of Two Cities and was expecting to really love this, but I just didn't see as many connections... or maybe it just lacked the sweet moments and characters I loved that Dickens brought to his story. In the end, was it what I wished for? If you love Women's Fiction, Memoirs or YA Historicals that are just telling the story of a woman and her daughter, then give this a try. It just wasn't for me. Content: Some references to abuse and pre-marital relations. Is this on your list to read? Did you already read it? Any thoughts on the book or my review?